WINDOW ROCK, Ariz. -- Like many college students, Wilhelmina Tsosie must go online to complete her assignments. But unlike the vast majority of Americans, she finds that the biggest challenge in her coursework is merely getting connected. Tsosie is a member of the Navajo Nation, the Native American community whose sprawling reservation has long been isolated from the rest of the country -- an isolation now being reinforced by the digital age. Like many Navajos, Tsosie, a petite 34-year-old with glasses and a jet-black ponytail, can't receive basic Internet service at home, because her home is too remote. She and her husband and their two young children live near the peak of a tree-covered mountain, beyond the reach of Internet service providers, forcing her to drive long distances to get online. This has never been easy, consuming time as well as gas money. Now, with local gas prices nearing $4 a gallon, Tsosie can no longer afford frequent trips to reach the Internet. She worries about the effects on her grades. Last semester, she failed a class after missing too many assignments -- the result of unreliable web access, she says. "If I passed that class, I would have been on time for graduating," Tsosie said. "I would have had one semester left and now I have two." Her husband, Ben, said the long journeys to find an Internet connection have begun to feel "hopeless." "Sometimes we don't have the gas money to go 30 miles to get on the Internet," he said. Tsosie's dilemma reflects the extreme difficulties many Navajos confront in seeking to connect with the rest of the world. Some park on the side of highways, climb atop roofs, or drive to the peaks of mountains just to get within range of mobile telephone service. Others travel dozens of miles to use Wi-Fi hotspots outside hotels, restaurants and chapter houses -- the local community centers on the reservation. Some who lack electricity run their computers on gas-powered generators. Native Americans have long experienced disconnection from the rest of the country -- their reservations are generally placed on remote lands with little economic potential, separated from modern-day markets for goods, as well as higher education and health care. The dawn of the Internet was supposed to bridge this gap, according to the promises of prominent public officials. Fiber optics cables along with satellite and wireless links would deliver the benefits of modernity to reservations, helping lift Native American communities out of isolation and poverty. But the rise of the web as an essential platform in American life has instead reinforced the distance for the simple reason that most Native Americans have little access to the online world. Less than 10 percent of homes on tribal lands have broadband Internet service -- a rate that is lower than in some developing countries. By contrast, more than half of African Americans and Hispanics and about three-fourths of whites have high-speed access at home, according to the Department of Commerce. Sonny Clark, 59, who lives in the remote Navajo town of Crystal, N.M., must drive five miles up the Chuska Mountains to get a cellphone connection, and 30 miles to Window Rock -- where he works for the tribal government -- to get online. He goes to these lengths just to stay in touch with his children, who live out of state, trading emails and text messages. "I'm in no-man's land," Clark said. "Native Americans face an ever-increasing digital divide, because they have been purposefully discriminated against in the business models and rollouts of next-generation networks," said Sascha Meinrath, director of the Open Technology Initiative at the New America Foundation, a public policy think tank. "These are places that have been systematically forgotten by society." In April 2000, President Bill Clinton -- who presided over the mass explosion of the web -- visited the Navajo reservation to announce a new program aimed at bringing some of the benefits here. on the need for telephone and Internet access. During his visit, Clinton met a 13-year-old Navajo girl who had won an iMac computer in a contest, but lacked phone service in her home, making it impossible to connect to the Internet. He announced a new program that promised telephone service across the nation's tribal lands for only a dollar a month, portraying the Internet as a transformative force. 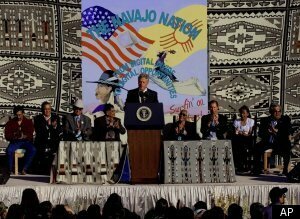 "I am here because I believe the new technologies like the Internet and wireless communications can have an enormous, positive impact in the Navajo Nation," Clinton said that day, addressing a crowd of some 25,000 people gathered in the Navajo town of Shiprock, N.M. "They can help you to leapfrog over some of the biggest hurdles to develop your economic and human potential." In 1995, while the Internet was in its infancy, a report from the federal Office of Technology Assessment issued a prescient warning of the looming digital divide. "Absent some kind of policy interventions, Native Americans are unlikely to catch up with, and probably will fall further behind, the majority of society with respect to telecommunications," the report declared. Then, in 2000, Clinton was here in the name of spurring development, declaring that the benefits of the web "can be the greatest equalizers our society has ever known." "By virtually any measure," the Federal Communications Commission declared in 2000 -- the same year that Clinton spoke -- "communities on tribal lands have historically had less access to telecommunications services than any other segment of the population." The Navajos are particularly representative of this disconnect. The country's largest tribal reservation, the Navajo Nation is home to about 170,000 people scattered across a vast desert punctuated by sandstone cliffs and flat-topped mountains, stretching across parts of Arizona, New Mexico and Utah. Many Navajos still herd sheep and cattle, heating their homes with wood-burning furnaces. Some live in trailers or traditional eight-sided homes called "hogans," their front doors facing east to greet the rising sun. About 16,000 Navajo homes, or about 30 percent, have no electricity. Some lack running water. Covering about 27,000 square miles, the Navajo Nation is roughly the size of West Virginia. That state -- one of the nation's poorest -- has more than 18,000 miles of paved roads, as compared to the 2,000 miles that thread Navajo country. After heavy rain or snow, the reservation's unpaved roads become impassable for days on end. "The reservation is like 20 years behind the rest of the country," said Barry Heifner, managing editor of the Gallup Independent, a daily newspaper on the reservation. Largely disconnected from the rest of the American economy, Navajos have generally been denied a share of national prosperity. About 40 percent of Navajos live in poverty, and the median household income is just $24,000, according to Census data. Almost one quarter of Navajo people are unemployed -- nearly triple the national rate. The high school graduation rate is about 30 percent. The death rate for diabetes among Navajos is three times the national average. "The potential is staggering," Clinton told the Navajo Nation. "We have to seize it." But more than a decade after Clinton's visit, many Navajos are still waiting for the results. Only 40 percent of Navajo homes have even basic telephone service. The resulting stories of lost opportunities abound. A Navajo man missed two chances for a kidney transplant because he lacked telephone service at home and couldn't be contacted in time, according to a 2005 report in the Gallup Independent. In times of emergency, Navajos often have no way to summon help because of the lack of phone service. And without landlines or addresses, the reservation's 911 system can't trace the location of calls. Often, frantic callers are misrouted to faraway dispatchers who must transfer the call several times to find the closest emergency personnel, costing precious time. "Sometimes people call 911 and they get someone in a whole different part of the state," said Tina James-Tafoya, a spokeswoman at Fort Defiance Indian Hospital, a medical facility on the reservation. "It takes time to track down where the calls come from. It is a problem." A 2009 report by Native Public Media and the New America Foundation found "a very real digital divide between Native America and the nation as a whole in terms of access, coverage and affordability of service." Geoffrey Blackwell, head of the FCC's Office of Native Affairs and Policy, told a Senate panel last year that the lack of communication services on tribal lands was "alarming." Nearly half of the Navajo Nation is under 25 years of age. Many young Navajos are frustrated by the slow arrival of the digital age, prompting some to leave. Raleigh Silversmith, a 21-year-old student who attends the University of New Mexico in Gallup, complained that he is often unable to finish homework assignments on the reservation "because the Internet service around here is just so bad." The college's IT department "can't get a simple wireless access point going for more than 24 hours," he said. Such sentiments garner little sympathy from many older Navajos, who don't understand the need to get online, he added. "They'll say, ‘Look at us. We're still here and we didn't have the Internet,'" Silversmith said. "But for the younger generation, everything is online. If you want to go to school, you have to do some sort of online work. Not having Internet around makes it so hard." Silversmith, who has gelled black hair and black-rimmed glasses, was sitting with three friends in a booth at a Denny's restaurant in Window Rock, Ariz., the seat of the Navajo tribal government. The town was named for a 200-foot-tall sandstone formation with a massive hole punched through its center, traditionally revered by the Navajo people as a portal to the spirit world. Today, the town feels to Silversmith like a passageway to nowhere: He plans to transfer to another school, either the University of Washington or New York University, partly to gain better access to technology. He has no plans to return to the reservation. "I can't stay here for 10 years hoping that technology will finally come to the reservation," he said. "For a lot of the younger people here, the motivation is, ‘I want to get out of here so I can experience what the rest of the world has.'" By many indications, the costs of not being online have only increased in recent times. About 80 percent of Fortune 500 companies now only accept job applications online. High school students who have broadband Internet at home have graduation rates 6 to 8 percentage points higher than students who lack such access, according to a Federal Reserve study. A 2009 report by the U.S. Department of Agriculture found that rural communities with greater broadband Internet access had greater economic growth. Native Americans face unique consequences. Some tribes without Internet service cannot apply for much-needed federal grants because the applications have moved online. "If you don't have Internet access at a high-rate of speed compared to the rest of the country, you're taking away any hope of tapping into the source of business growth for economic development," said Tom Davis, dean of instruction at Navajo Technical College. "You're going to do what's been done for 100 years here. You're going to keep generating generational poverty." Not all health care providers on the Navajo reservation have Internet, creating the potential for life-threatening medical errors. Some patients have been prescribed the wrong combination of medicines because doctors are unable to look up their health records online, says Walter Haase, general manager of the Navajo Tribal Utility Authority. "It can be very dangerous to give patients two things that don't work well together," he said. Some local health representatives drive four hours round-trip to treat patients in remote areas. If these patients had a connection at home, the consultations could be done over the Internet. Staff could spend more time helping patients and less time on the road, according to Mae-Gilene Begay, a department manager for the Navajo Division of Health. Charlie Burns, who lives in Huerfano, a remote Navajo chapter southeast of Farmington, N.M., blames a lack of Internet at home for his continued joblessness. He has been unemployed since June, when he was laid off from his accounting job at the local chapter house because of a lack of funds. His home, which he shares with his mother and brother, looks out on rolling desert hills blanketed with knee-high sagebrush. Stray dogs with wagging tails mill about near a pile of tires lying in the dirt. Some of Burns' neighbors receive a wireless Internet signal from a tower atop a mountain, but he lives in a valley beyond the signal's reach. So the 47-year-old Navajo man drives more than 50 miles round-trip twice a week to the library or unemployment office in Farmington, N.M., to look online for construction jobs. Each trip costs about $25 in gas. But his sporadic Internet access carries an even greater price: He has missed five emails from employers offering him construction work. If he doesn't respond in time, he doesn't get the job. "I can't check email every day so I'm missing out on employers contacting me right away," he said. A combination of financial and geographic factors have conspired to render web access on tribal lands a particularly difficult proposition. Simply getting the infrastructure in place often proves expensive and complex. In 2000, when an Internet provider brought service to the Havasupai tribe, it reportedly used a caravan of pack mules to carry satellite dishes down eight miles of rocky trail to the bottom of the Grand Canyon. Telecommunications companies are prone to eschew tribal lands because wiring them comes at a high cost and lesser return, given the relatively small numbers of potential customers. Many Internet providers avoid rural areas altogether. As a result, about 18 million rural Americans currently have no access to high-speed Internet, according to the FCC. Tribal lands are among the most sparsely populated places in America. On the Navajo reservation, there are only six people per square mile, as compared to 27,000 people per square mile in New York City. To encourage investment, the federal government has subsidized telecom companies that serve tribal lands with grants and loans. Some tribes have become their own Internet providers. Experts say they should be given greater access to the so-called "wireless spectrum" -- the radio waves that deliver cell and wireless Internet signals -- to help increase broadband on their reservations. But others see another impediment to the deployment of telecommunications on reservations. Native tribes are sovereign nations with their own set of laws. To install Internet infrastructure, companies must get "right of way" approval from the Bureau of Indian Affairs, a federal agency that manages tribal land. That process -- which entails environmental and archaeological reviews -- typically takes at least two years to complete. Sacred Wind Communications, a small telecom firm based in Albuquerque, has brought telephone and Internet service to about 3,600 Navajo households in New Mexico with loans from the federal government. But the company has waited several years to gain approval for about a dozen projects to bring Internet and phone service to more than 1,000 unserved Navajos. "We have the will, the ability and the means," says John Badal, chief executive of Sacred Wind. "But we don't have the permission." The Obama administration's stimulus spending package included $7.2 billion to expand high-speed Internet access in underserved areas, including tribal lands. One stimulus-funded project is aimed at delivering broadband to 8,900 members of 15 Native American tribes in rural San Diego County, Calif. Another is intended to provide computer centers and teach digital literacy to members of the Saint Regis Mohawk Tribe in upstate New York. About $32 million in stimulus money was set aside for the Navajo Tribal Utility Authority, which is laying cables and building towers to deliver high-speed Internet to 15,000 square miles -- or more than half -- of the reservation. The project, which is slated for completion next spring, is supposed to serve 30,000 households, 1,000 businesses and 1,100 institutions. But even after that project is completed, other obstacles remain. Some Navajos are still wary of the Internet. Many lack the equipment needed to get connected. "If we get Internet, who's going to buy me a computer?" asks Jennifer Begay, 27, who lives in Red Mesa, Ariz., a remote Navajo community near the Four Corners region. "A lot of people out here don't have computers or laptops. They can't afford them." Experts and lawmakers say the stimulus funding -- though a good start -- falls short of the investment needed to rebuild a telecommunications infrastructure on reservations that is decades behind the rest of the country. "Given the magnitude of the needs, this can only be considered a small down payment," Sen. Daniel Inouye, a Democrat from Hawaii, said at a Senate hearing last year, before adding: "The worst thing we can do is provide for an empty promise. Too much of that has gone on over these many years." Even as worries intensify about the consequences of the digital divide besetting Native American communities, the potential benefits of the web appear to be growing as well, amplifying hopes that its ultimate spread could yet prove redeeming. RezKast, a widely-watched Native American YouTube channel launched in 2008 that includes, among other things, videos of Native American religious and cultural ceremonies. Both the Navajo and Cherokee nations -- the country's two largest tribes -- have developed apps for Apple mobile devices that promote their native languages. In an interview in his wood-paneled office in Window Rock, Navajo Nation President Ben Shelly proudly showed a visitor the application on his iPad. a Navajo language app for his iPad. He tapped his finger on the screen, prompting a woman's voice to say the Navajo term for "arm." Shelly repeated it, and then smiled. "That's Navajo," Shelly said. "That's education right there." For 16 years, Everett Baldwin, a 73-year-old Navajo medicine man who makes ceremonial teepees, tried unsuccessfully to get a telephone. The local service provider told him it would cost $4,200 to connect his remote home near the top of a small mountain outside of Gallup, N.M.
Then, about two years ago, Sacred Wind installed a wireless tower on his property. Now, with telephone and Internet service at home, Baldwin sells his teepees online for $800 and responds to emails from potential customers as far away as Japan and Australia. Baldwin, who wears rose-tinted glasses, blue jeans, and keeps his gray hair pulled back into a ponytail, makes his teepees using canvas, thread and an industrial sewing machine. Inside his three-bedroom house, a laptop sits on his desk and finished teepees are rolled up and stacked in the corner. Freshly-peeled teepee poles made of douglas fir lean against a tree outside. "To be able to afford Internet makes me feel like a millionaire," Baldwin said. Many rural health clinics on the reservation also now have Internet. Navajo patients who live near them don't need to drive hundreds of miles to see a doctor. With broadband, psychiatrists in Albuquerque treat patients by teleconference, and radiologists in Oklahoma City read their X-rays. In December, doctors at Flagstaff Medical Center, located just west of the reservation, began a year-long pilot project that uses wireless technology to remotely monitor several Navajos at risk of congestive heart failure. The patients were given health-monitoring devices and Android smartphones to send readings of their blood pressure, oxygen levels, weight, and heart activity to nurses in Flagstaff. One Navajo patient without electricity or cell service was given a solar-powered phone charger, said Gigi Sorenson, director of telemedicine services at Flagstaff Medical Center. To send his health updates, the patient drives about a mile until he finds wireless reception. Sorenson said a "huge spike" in diabetes among Navajos is not being treated properly. About 36 percent of Navajos die from diabetes, compared with the national average of 13 percent, she said. But she held out hopes that the web could diminish the threat considerably. "If we can monitor them at home, we can keep them from going back to the hospital," she said. "We just have to be creative." Wilhelmina Tsosie is still hoping that she and her family will wind up among the beneficiaries of expanded web access on the Navajo reservation. For now, the Internet remains far away. Tsosie spent three years in San Diego while serving in the Navy before returning to the reservation in 2001 to be closer to her family. She got married and had two kids. She works as a part-time home-care provider, while her husband, Ben, sells firewood in parking lots on the reservation. Together, they bring home about $400 a week. They also tend a flock of 10 sheep. Tsosie aims to become a nurse. To stay close to home, she enrolled in online classes last year and signed up for satellite Internet service -- the only kind available at her remote home. At $70 per month, it was a stretch, but it was the only way to avail themselves of connectivity. Just after they got Internet, however, their car broke down. They couldn't afford to fix it and began paying neighbors to drive them places. They dropped their satellite Internet service to cut costs. Disconnected, Tsosie failed her online classes. A few months later, she began attending classes at Diné College, a Navajo school on the reservation, in person. Now, she makes the 120-mile round-trip four days a week from her home in Sawmill, Ariz., to the campus in Tsaile, Ariz. There is Internet at her local chapter house a few miles from her house, but there are rarely available computers, the websites she needs for class are blocked, and the chapter house is often closed by the time she gets off work. On weekends, she drives to Window Rock to piggyback off the free Wi-Fi network and do research or email assignments to her professors. For months, she was one of a dozen Navajos sitting in their cars with laptops in the parking lot of the Navajoland Inn and Suites in Window Rock to use the hotel's wireless signal. Recently, the hotel protected the wireless network with a password and started charging users $3 a day for access. Many left and have started using the free wireless at the McDonald's down the road to avoid paying the fee, Tsosie said. "If you really need Internet, you'll find a way to get to it," Tsosie said. "Whether it's a half hour away or an hour away, if it needs to be done, it will be done." Yet with gas prices rising, Tsosie now spends half her salary driving to and from school or to Window Rock to get online. To save money for gas, she and her family have deferred replacing worn-out clothing. They are eating more Ramen noodles and homemade tortilla bread for dinner. They are spacing out trips to the laundromat. Her husband, Ben, frets that getting connected is coming at too high a cost. "It's not worth having Internet if we have to starve," he said.